Fiona Percy presents learning from the Participatory Scenario Planning (PS) approach at ICCS5. Photo credit: Katharine Vincent via Twitter. Scroll down to view slides from the presentation. The Participatory Scenario Planning (PSP) approach for seasonal decision-making at the local level has now been adopted by national meteorological services, government departments and practitioners in various sectors as well as communities across more than 6 African countries and in South East Asia. So what has made it such a success? This question was asked by a number of participants at the Fifth International Conference on Climate Services (ICCS5) held in Cape Town from 27th February to 2nd March 2017. 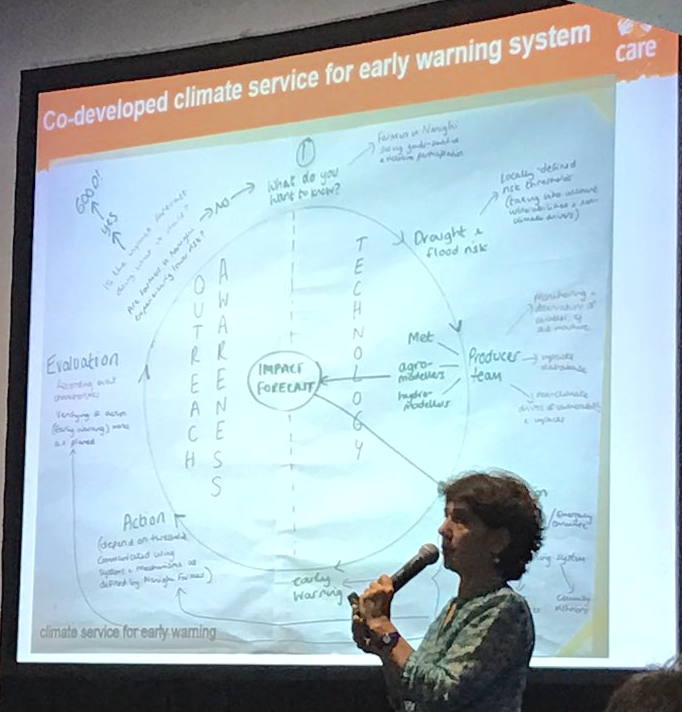 At the conference Fiona Percy and Maurine Ambani from CARE International’s Adaptation Learning Programme (ALP) described how much of the success of PSP comes from its multi-stakeholder approach to climate informed decision making. This is based on the collective interpretation of seasonal climate forecasts at PSP forums, which bring together a wide range of actors at the local or national level to discuss seasonal forecasts with meteorological services. These forums allow community members to contribute their local knowledge of the forecast in their area, and to provide their review of the current status of, for example, livelihood vulnerability, food security, vegetation cover, and livestock. Government sector services also contribute technical expertise on the implications of different forecast scenarios. As a result of these rich contributions and sharing of knowledge, communities, sector services, the private sector and NGOs are better able to plan their activities based on likely opportunities, risks and outcomes in agriculture, disaster risk reduction, adaptation and resilience. Through participation in the PSP forums meteorological services also gain new relevance and value through enhanced communication with stakeholders, as this presents an opportunity to increase their understanding of seasonal forecasts and levels of uncertainty. So why is the PSP approach so successful? A study is being conducted at the moment to understand the factors enabling such widespread adoption, and it is emerging that PSP is a simple and flexible approach that can be adapted to operate in a complex and evolving context. It also has its own momentum as a response to climate variability from season to season, and so gains traction and builds institutional engagement over time. A particular strength is the regular interaction, which supports continuous dialogue and local innovation for cross sectoral and cross level action, by ‘talking about the weather’. From Fiona Percy's presentation at ICCS5 (see below for full presentation): Regions in Africa in which PSP has or is in the process of being adopted. A common thread throughout ICCS5 was that co-developing climate services is essential to ensure continued engagement between climate service producers, intermediaries and users. This is at the heart of the PSP approach. Users – who are individual or organisational decision makers at the household, community, local and national levels – look forward to the regular multi-stakeholder interaction during PSP forums. The interaction gives users space to voice their needs, share and combine knowledge and relate forecasts to decisions for the coming season, in order to develop advisories for action. “What happens when you get ‘failed’ advisories?” asked one of the ICCS5 participants. A strength of the PSP approach is that scenarios developed during PSP forums consider local implications of all seasonal forecast probabilities and incorporate local forecast knowledge, so the potential for distrust when reality is different from the highest probability is reduced. Using local knowledge to reflect on the current situation is helping to build stakeholder’s confidence in understanding and using climate information in decision making, such as on what combination of seeds to plant or livestock management practices to spread risk and take advantage of opportunities. Managing failure also requires listening to the different information demands of stakeholders, and tailoring climate services to support the development of responsive local solutions. As they occur each season, PSP forums allow participants to learn about changing information needs, and evolve the process and participation to remain relevant to changing livelihood, sectoral and development priorities. For example, based on the forecast, government and private sector service providers are able to pre-position their response to decisions on new seed varieties or livestock vaccines and loans to purchase the seed and vaccines. At ICCS5, the increased connectivity between actors and services that PSP forums enable provided an excellent example of what collaborative engagement between all actors in the climate service value chain looks like in practice. However, it was noted that this may not happen organically. What has been critical to the success of PSP is firstly, a clearly stated purpose on its contribution, as a climate service, to broader climate resilient development goals within each context; and secondly, having good facilitation of targeted innovation and synergy between actors and approaches. For example, in Niger, ALP is supporting the use of data from community managed rain gauges to contribute to the advisories generated through the PSP process, and to provide real time data for action. In Ghana, ALP has supported establishment of Climate Information Centres targeted at enhancing equitable communication and access to climate forecasts and PSP advisories, as well as extreme weather alerts. Linkages are currently ongoing to connect PSP with other approaches, such as Enhancing National Climate Services (ENACTS) maprooms and the Participatory Integrated Climate Services for Agriculture (PICSA). This would help to develop a seamless suite of climate informed decision support tools across historical data, daily to seasonal forecast timescales. Pilot and research interventions on climate services in Africa – such as through ALP, the Building Resilience and Adaptation to Climate Extremes and Disasters (BRACED) programme, the Future Climate For Africa (FCFA) programme, Collaborative Adaptation Research Initiative in Africa and Asia (CARIAA), and Climate Services for Resilient Development (CSRD) – are enhancing innovation and capacity building in this sector. Demand for the delivery of widespread and more sustainable climate services to inform early warning and early action, adaptive social protection and plans to build climate resilience is rising. This is driven by the increasing frequency and intensity of climate hazards and resultant impacts, such as the acute food insecurity caused by prolonged drought of 2011 in the Horn of Africa and the severe 2015/16 El Nino induced drought across Southern Africa (see FEWS NET, the Famine Early Warning Systems Network). Flexibility – The promotion of PSP has focused on the adoption of principles for service delivery and social processes that are not locally dependent and can therefore be customised based on context. It is important then to identify good practices in an approach that can be scaled, as opposed to technical interventions which are context specific. Engaging with governance structures – In Kenya, meteorological services have been decentralised to county (sub-national) level and PSP has enhanced the role and capacity of County Directors of Meteorology to support climate resilient development. At the same time, the Agriculture Sector Development Support Programme in the Ministry of Agriculture, Livestock and Fisheries is operational in all the 47 counties in Kenya, and adopted PSP as an approach to strengthen the climate resilience of agricultural value chains. The two actors were therefore a strategic fit for collaboration in implementing PSP throughout Kenya. Working with mainstream governance structures to transform existing services and relationships towards being demand-driven is key. The integrity and quality of PSP and other approaches as they are replicated in different places by different actors. Governance structures that overcome sectorial silos, and where all actors have equal weight and commitment to resourcing the service. Participation and voice of users in climate services, which is influenced by challenges raised in the two points above. What next for climate services? In his concluding remarks, Bruce Hewitson (University of Cape Town) noted that one of the emerging commonalities throughout ICCS5 was a recognition that climate services is complex and complicated. This agrees with a key learning from ALP’s PSP approach that for climate services to contribute to building resilience, processes that continually re-evaluate the context, anticipate future uncertainties and foster seemingly unlikely relationships are essential. As Bruce put it, this is a clear call for more accountability, communication, collaboration and innovation in climate services.